Hearty Congratulations for the great performance and the grand success of Saturday’s programme on Pancham Da. I was on Cloud Nine during the entire programme. I was the first (among audience) to reach the auditorium at 4.30 PM! The teamwork among all was excellent. Aniket’s sense of humour was tremendous and it reached its peak when he danced with a small boy at the end, singing “Humko saathi mil gaya!” The performance was excellent. The hospitality was very good. The arrangement and the hand-out book were very professional. The acoustics and the hall were very good. There was a delay of 40 minutes in starting the programme. The person on my next seat was complaining that he needed to return by 9 o’ clock and he would miss the songs at the end of the programme while late comers would enjoy the entire show. He was penalized for being punctual! Please start the programme on time. miniscule compared to the clapping from 1100 pairs of hands and joyous dancing from the old and the young alike! The souvenir is very good in presentation and many of my friends appreciated it. The song selection was very good. The compering was great. Above all, the cause of the programme to help the children who suffer for no fault of theirs is supreme. May your good works continue for a long, long time. Congratulations on a very successful show on Saturday evening. We attended it with some friends and thoroughly enjoyed the evening. Aniket set the stage on fire – he was the heart of the show. 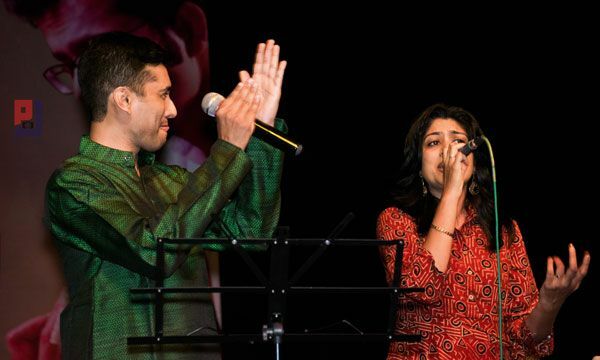 It was the first time we heard Tushar sing (our friends had heard him at your previous concert) – and loved it. I also wish more songs had been given to Prahlad – he was outstanding. His rendition was clean, soulful, and very involved. Why did Rujuta seem nervous in the first half of the show? With such an amazing voice, she had no reason to be so. She really established herself in the second half. With a ready smile and such a warm nature, she can do better in terms of establishing a rapport with the crowd. Please consider this as a truly well-meant feedback from a genuine well-wisher. But all in all, the enthusiasm of your group and the spirit of your music was contagious. We had come to the concert with 4 young kids – 4 kids who don’t know anything about Indian music prior to the 1990s – and they thoroughly enjoyed the show. They were clapping and tapping their feet, and we had a hard time containing the little boy in our group- he just wanted to get up and dance! Congratulations again. It was a fun evening for our family. We wish you continued success in the years to come. I attended your first performance and was really impressed. I enjoyed the Pancham concert on this Saturday, And I am very much interested to join your group. I am eager to meet and be a part of Zansam A.S.A.P. Congratulations on the very successful event last Saturday. We thouroughly enjoyed the show. The song selection was superb and you all performed with great enthusiasm and passion. Aniket was too good! We look forward to your programs in future. Warm regards and best wishes. At the outset, my hearty congrats to you all for producing a really ‘joshila’ show. Your lead singer Aniketh is a bundle of infectious energy and has powerful lungs (and makes very good use of it). He did extremely well in the Kishore-Kishore duet and all his on-stage antics added to the effect. Your congos player is is a damn talented guy and you do have your excellent flautist and the mouth organ specialist who together can play a few pieces. Overall BRAVO,guys! Keep up the good work but work on all the weaknesses, so that you can produce “flawless” shows.